I am loving this 52 week challenge because it is pushing me to do things I wouldn't normally do. I don't love plaid and probably wouldn't have done this had I not scheduled it. I am a shcedule whore. 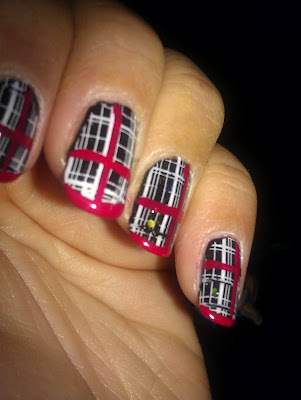 I had a hard time deciding if I wanted to do free hand plaid or stamp. I was tired last night (as I had just driven from Pittsburgh to Michigan) so I decided to do the stamping. I am pleased with how it turned out. They feel Scottish and I want to come up with a clever name but I can't think of one. What would you name these?